There are many beautiful and resilient plants from the woodland understory of eastern North America that can enliven a shady landscape on your property and change your perception about gardening in the shade. There are woody and herbaceous species with delicate blossoms, an array of fruits and seeds, a variety of leaf shapes and colors, and interesting bark or branching patterns. Shady landscapes are easy to care for since they require minimal weeding and watering. In addition they support a host of interesting woodland birds, pollinating insects and small animals, and are lovely places to be on hot days. Clearly, cool shade is something that we will all be needing more of in the coming years. Every human inhabited landscape has at least some shade due to the structures around us. Even on a treeless lot, the north, east, and west sides of buildings are without direct sunlight all or part of the day. Deciduous or evergreen trees, and woodland edges also create shaded habitat. Unfortunately these environments are often overlooked in our developed landscapes, yet they provide a great opportunity to increase the diversity of woodland flora. Trees are key players in moderating the global climate. They reduce surface temperature by capturing the energy in sunlight and converting it to growth of biomass rather than heat. Trees remove carbon dioxide from the atmosphere and store it in their woody tissue and in return give us oxygen to breath. They capture rainwater and help it absorb into the soil, reducing flooding. Native trees are biodiversity magnets because they host a variety of fauna in their canopy, bark and roots. For these reasons, we should all look for opportunities to plant trees and create more shade in our urban, commercial, and suburban landscapes. The Eastern deciduous forest biome that stretches from Canada to Georgia is the world’s richest temperate woodland ecosystem with a diverse mix of plants that thrive in the shade of the canopy trees. In Maine we are part of the transition zone between the Eastern deciduous forest to the South and the boreal forest to the North. 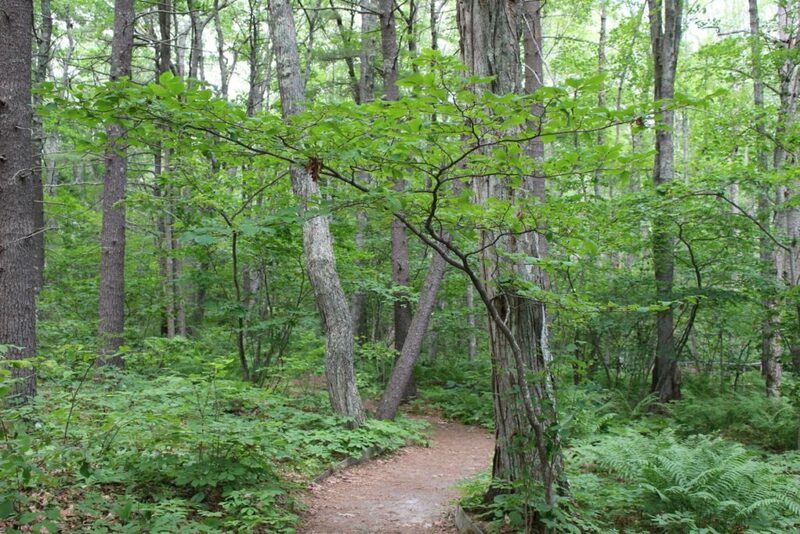 Canopy trees include deciduous oak, maple, birch, beech, bass, and ash, and coniferous evergreens of hemlock, spruce, fir and pines. It is in the ground layer of the woodland understory where the most botanical biodiversity resides. Wildflowers, ferns, small shrubs, understory trees and juvenile canopy trees all make a rich tapestry that is beautiful as well as biologically dynamic. Many of these plants are easy to grow and will thrive in shady locations in our urban and suburban landscapes. The forest serves as a model to help you design and choose plants for your shady site. Analyzing light levels, adding layers of vegetation, and creating woodland soils are the three key concepts that you must address on your site. 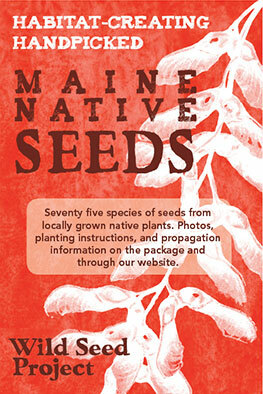 You can add natives to your existing plantings or create a purely native habitat garden. Either way, you will be supporting a diversity of pollinators and birds with these wildlife friendly natives of the woodland understory. Thinking about how the plants of the forest have adapted to life in the shade will help you choose how to include them in your landscape. Plants that grow under deciduous trees receive more direct and indirect sunlight than plants growing on north facing slopes or under evergreen trees. From the time they lose their leaves in the fall through mid to late spring when the trees leaf out, deciduous trees let light through to the forest floor. Many woodland wildflowers bloom in the spring to take advantage of this early season light. Other understory plants manage to capture enough light even in locations with no direct sunlight. These are the plants that can tolerate the immediate north side of a building which is usually in complete shade. Farther out, the light levels can increase depending on the time of year. Adding small to medium sized deciduous trees in this zone will add dapple shade in which these woodland plants thrive and will prevent them from being scorched during the height of the summer sun. Creating layers of vegetation with understory trees and large shrubs is an important element of shade planting. These layers provide habitat for birds and pollinators, which in turn makes a much more visually interesting landscape than just planting the ground level. The photo at the top of this blog shows the layers of vegetation in the oak woodlands at the Rachel Carson Preserve in Wells, Maine. For detailed explanations and photos of this concept read The Living Landscape by Rick Dark and Doug Tallamy. The nature of the woodland soil is another important component when creating a shaded habitat. Every year, the leaves of deciduous trees, shrubs and wildflowers die and return to the soil to decay and provide nutrients and insulation to the soil and its diversity of life (e.g., fungi, microorganism, insects and small animals). You can mimic this in your shady landscape by adding plenty of organic matter in the form of compost, leaf mold, or very well aged natural hardwood bark. If the existing soil is compacted from construction or foot traffic, it will need to be loosed with a digging fork. You are not trying to turn the soil over, just loosen the compacted soil while being careful of existing tree roots. In the fall, when the new crop of leaves falls on your beds, leave them. The leaf litter will improve the soil and provide overwintering habitat for many beneficial creatures such as butterflies, moths, frogs, salamanders and ground nesting birds. Conifers are more challenging to plant around because of their acidic needle drop and because they tend to have many surface roots that compete for water and nutrients. I recommend thinning their canopy to let enough light in to support more understory plants. NOTE: Many woodland wildflowers including trilliums, Dutchman’s breeches, lady’s-slipper orchids, ferns and others are stilled poached from the wild, vs. nursery propagated. 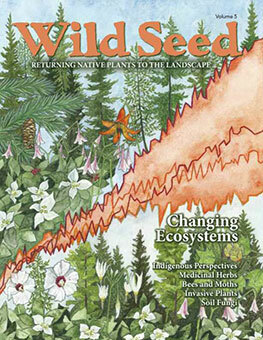 Please do not purchase wild collected native plants. 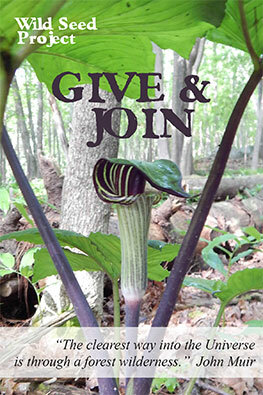 See blog post Where the Wild Things Are: Pink Lady Slipper Orchids and Poachers.